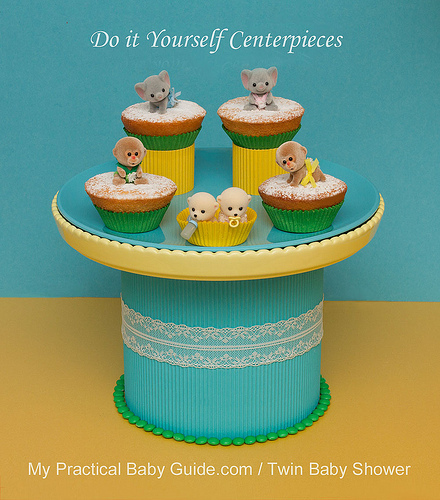 This is a simple to do twin baby shower centerpiece. The charming twin images are from the Sylvanian Families collection and can be bought at Amazon . 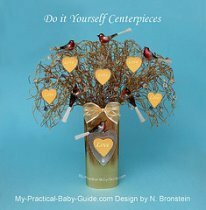 Although we designed the centerpiece especially for a twin baby shower, the idea can be adapted to many other parties and celebrations. 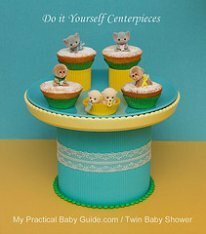 It will be just as great for a safari themed baby shower, and with a change of characters to any other theme imaginable like rabbit, bunny, giraffe, monkey, elephant, nautical... the Sylvanian Families collection is just endless. 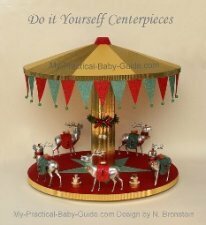 The centerpiece will be most suitable for children birthdays as well and when the party is over they can be given as favors. They are also fun to collect, you will surely fall in love with them. The color scheme includes medium turquoise/blue, canary yellow, green and touches of white. 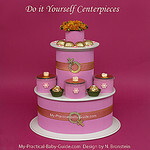 The images add touches of soft gray, pink and brown. A footed plate holds the centerpiece. 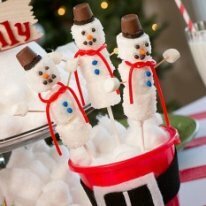 The delicate white lace ribbon around the paper covered foot links to the airy sprinkled confectioners sugar. The small candy ring around the bottom of the foot matches the pattern of beaded plate's rim. 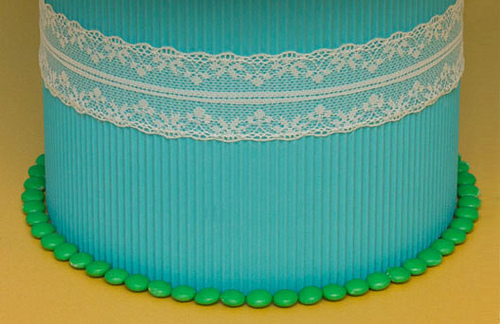 The green color of the tiny candies matches the shade of the cupcake liners thus giving a right balance of colors to the centerpiece. 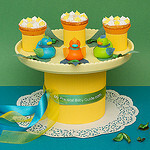 The four cupcakes in paper liners topped with the Sylvanian Families Twins are displayed on a turquoise plate. 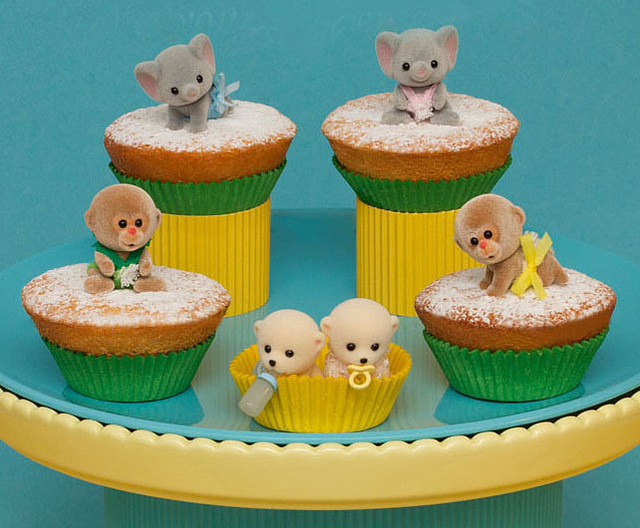 The cupcakes at the back sit on a ring made from corrugated paper. 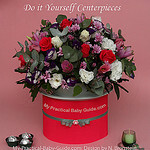 Click on this link to see more twin baby shower centerpiece. 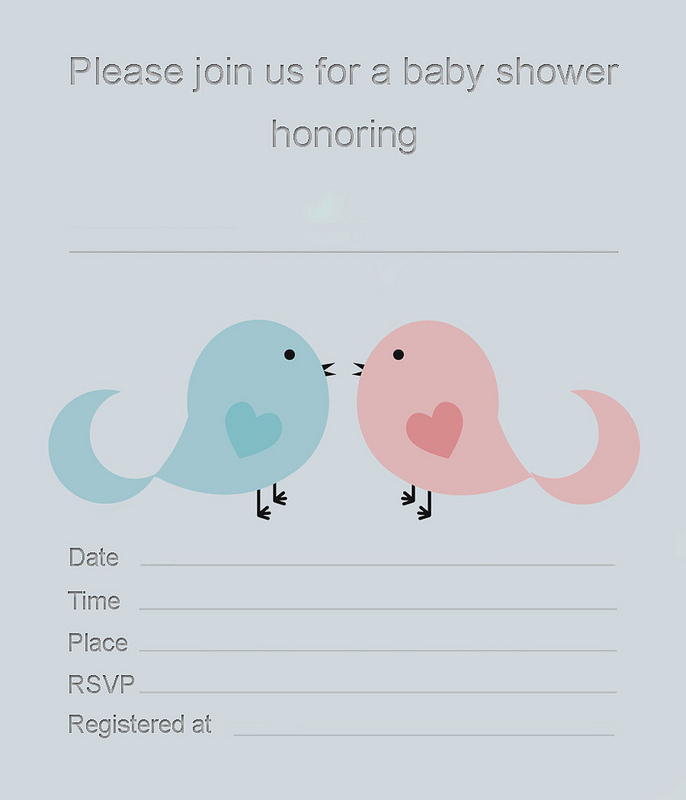 We designed some twin baby shower invitations which will complement your theme. 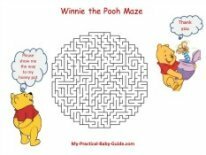 Click on the photo below to see more designs and download your choice for free.